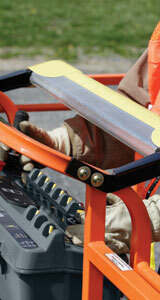 The JobSite is getting a makeover, thanks to your recent survey participation. After receiving your feedback, we’ve revamped the e-news to provide you with more of the news you want to read. Thanks again, and we hope you enjoy this and future issues of The JobSite. 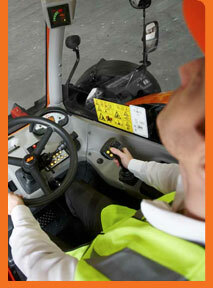 SkyGuard™ is designed to provide enhanced control panel protection and is currently undergoing prototype testing. SkyGuard is positioned in front of the platform control panel, where a sensor bar is currently designed to detect pressure of approximately 50 lb (22 kg) or greater from various angles. Available on all combustion-powered JLG® boom lifts manufactured in 2009 or later, SkyGuard is designed to provide additional protection while minimizing nuisance trips. A must-have tool for equipment fleet managers and maintenance technicians in the field, this free app provides GPS mapping and real-time machine data viewing for our ClearSky® connected asset technology. Get up-to-date alarms, run hours, fuel amount and more. The Near Me mobile app is available for the iPhone, Android and BlackBerry. Upon downloading the Near Me app, you must contact the ClearSky Support Team for your username and password. 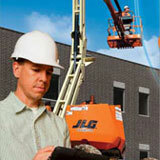 You can call 877-554-5438 option 8 or email clearskysupport@jlg.com. Become a fan of JLG Ground Support® and get the latest news on everything from added service providers, tech tips, used equipment auction info and much more. Our Facebook page is a great place for you to tell us what you’d like to read more about. We’d love to hear from you! ARA now expects overall North American equipment rental industry revenue to increase at least 8.6% in 2012 to total $34.1 billion at year end. As equipment rental companies continue to expand inventory to meet anticipated greater demand, investment in new equipment as a percentage of rental revenue is expected to reach 31.6% or $9.8 billion this year. The Portland Cement Association (PCA) adjusted its fall forecast of construction industry growth, anticipating a modest 3.7% increase in 2012, followed by a 7.6% jump in 2013 and a 14.1% increase in 2014. Cement consumption is expected to increase right alongside the industry’s growth. Since tires are one of the largest expenses in maintaining a telehandler, part of the tire industry’s quest is to offer telehandler owners and users better reliability, traction, ride, life and cost of ownership. 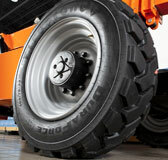 The three main types of telehandler tires are pneumatic (air filled), foam filled and solid rubber. JLG, Lull® and SkyTrak® telehandlers have all been upgraded with Firestone DuraForce MH tires. With four models to choose from, the new Powershift Series features powershift transmissions, Stage IIIb compliant Deutz engines and can be tailored for specific work purposes thanks to a wide variety of attachments.